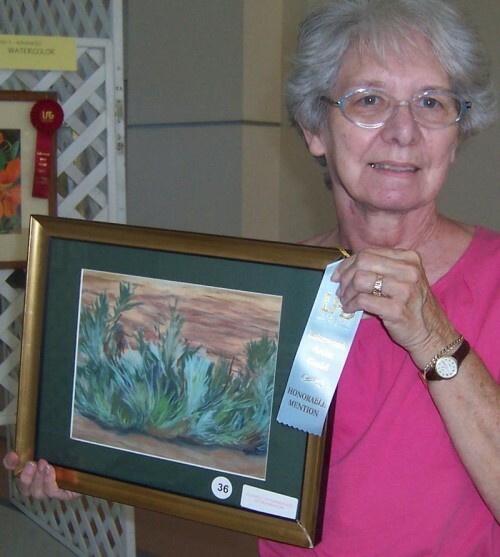 This is an 11″ X 14″ pastel painting titled Lone Pine that I am happy to report received a first place ribbon in the Other Media category in the Lakewood Artist Guild’s Spring Art Show on April 21st. 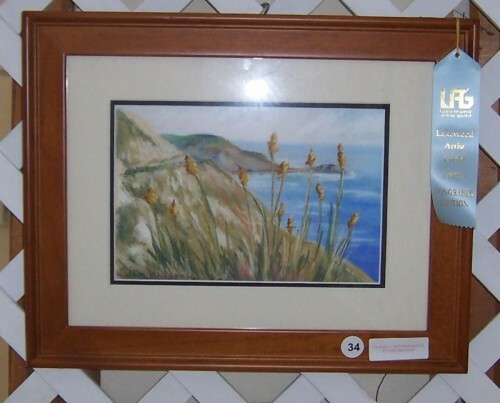 I also received a third place ribbon in the same category as shown further down. Yep, it’s a blue ribbon! 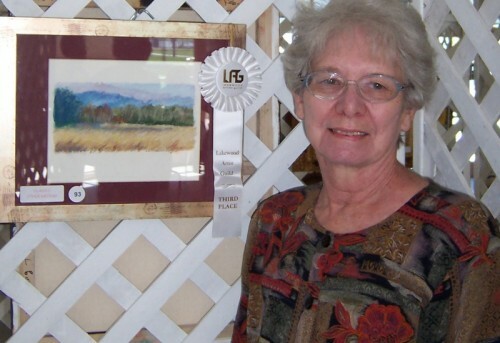 This is a 4″ X 9″pastel painting floating in a 7-1/2″ X 10″ space titled Golden Meadow and was the one that got the third place ribbon at the show in the Other Medium category. I was totally surprised (and pleased, of course) with the judge’s decision! I’m happy to be back painting again. This is the longest break I’ve taken in a very long time, although I have been sketching occasionally during that time. Hopefully, I haven’t lost too many visitors in the past 3 or 4 months, but I’m determined to work daily and share my art adventure with you all. The show was a wonderful return to public viewing! Well, this photographed a little darker than I wanted, but it’s been sitting on my board for at least two weeks and I’m anxious to move on (despite the holiday shopping still to do!). The closer set of trees are especially lighter and easier to read on the original. This is a 9″ X 12″ pastel , mostly Ludwigs and Unisons. Maybe I should work on a Christmas one now. That should be lighter, right? We have no snow here…..but the leaves are changing color and dropping around the trees. Let’s see, if this is Fall in SoCal, then winter shouldn’t be too close behind…..maybe January? Enjoy. Comments are always welcome. 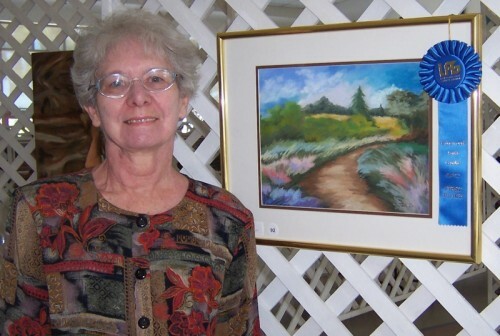 Yesterday the Lakewood Artist Guild held their Fall Art Show. 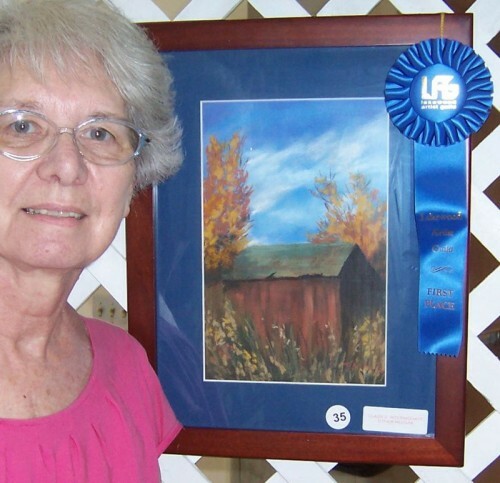 I was absolutely thrilled to receive awards for 3 of the 4 pastel paintings I entered. 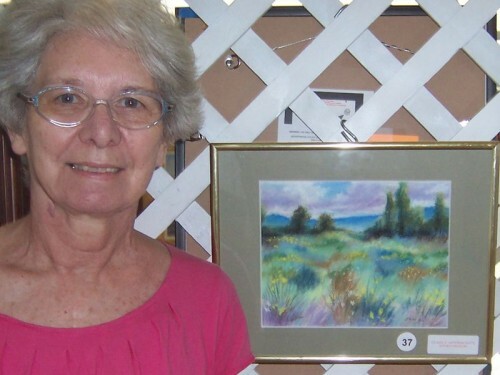 Below was chosen for First Place in the Class 2- Intermediate group that included watercolors as well as all media other than oil, acrylic and photography. 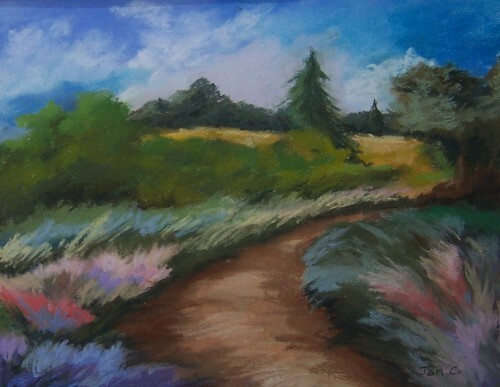 I’m hoping someday they will judge pastels on the same level as oils, but in the meantime, I’ll take what I can get! Photos of all 4 are below. 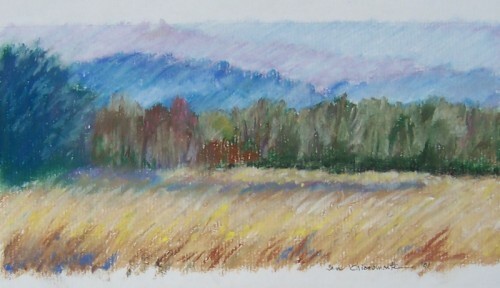 This is an 8 X 11 pastel titled Country Living. Don’t you just love blue ribbons? 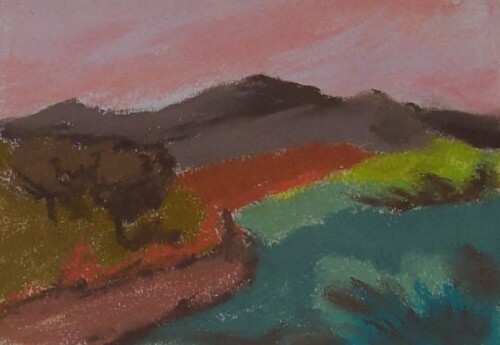 This is an 7-1/2 X 11-1/2 pastel titled Big Sur Spring. The light blue ribbon peeking into the picture is an Honorable Mention. 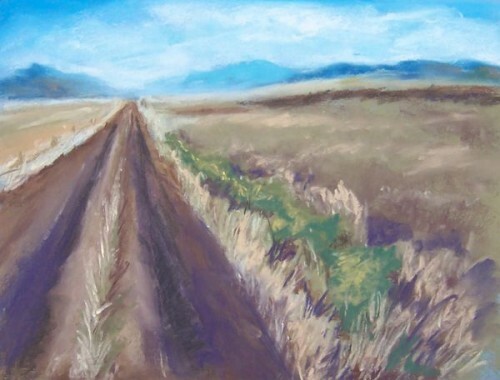 And now the “also ran” titled Meadowland. It really was a great show and I’m now looking forward to our spring show in 2013! 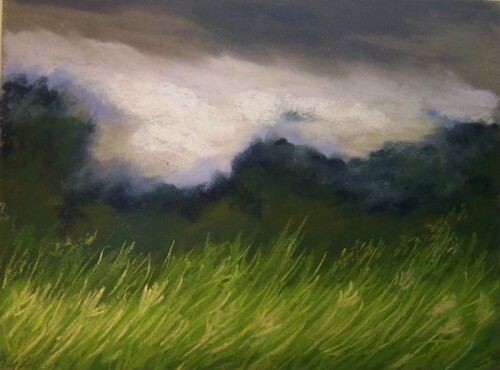 I just finished having 4 paintings in an office in Los Alamitos in June through September. 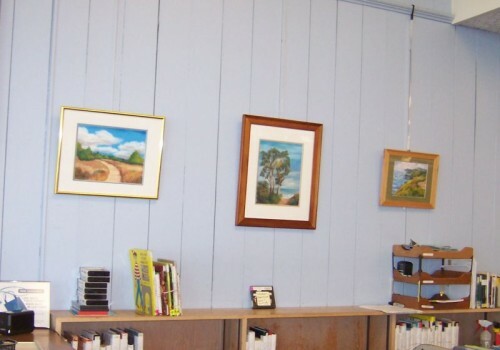 This time I was chosen to display 3 paintings in a small library in Long Beach. The checkout counter and other equipment are below the camera angle and it turned out that the best shot I could get was to stay behind it. Quite a bit of glare from a wall of windows to the left of the area. Anyway, these are all pastels that I believe have been shown here in the blog: Golden Path 10 X 14, Coast Sentinels 14 X 10 and Big Sur Coast 9 X 12. However, I think I’ll be changing some or all of them after awhile. I think some autumn landscapes would be perfect here. I can’t tell you how difficult it was to get these hung on the devises they use there which include long hanging strips of some sort with movable hooks. Centering the paintings both vertically and horizontally was “fun”. Last night was Lakewood Artist Guild’s first fall meeting. As I’ve mentioned before, many attendees bring what they are currently working on and the guild votes on favorites. I have to admit I enjoy seeing my paintings up with all the others. Last night, the paintings were spread out so far, I just took a quick picture of my latest along with the ones sitting close by. We had a great time doing something somewhat surprising. Our speaker has been a teacher for 37 years and also teaches several children’s groups (one has a membership of 60!). She brought a wide range of the materials she uses for us to sample. True, they were primarily by Crayola, but I was stunned at the array of different materials and colors, including brush crayons, and wipe-offs. There was also quite a few pencils in beautiful colors It’s definitely worth a look at a store, like Michaels, or Blick to see what’s available – for you or your kids. Not just your old 8 piece color crayon set any more, that’s for sure! Well, this one was really different for me. 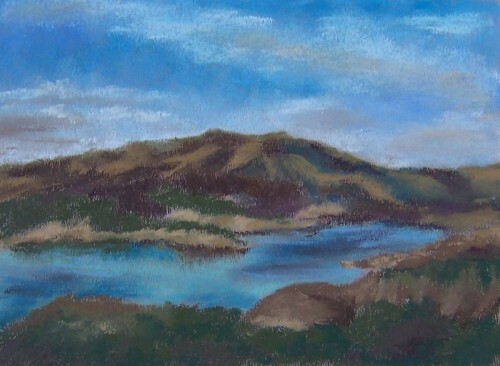 Even though it is soft pastel on Mi-Tientes paper (smooth side)…which I do a lot….I found that I had chosen a picture taken years ago on a trip and didn’t spend much time planning the painting. I use thumbnail sketches about half the time in planning, otherwise, I just take a pencil or stick charcoal and mark where things are going to be. It’s not unusual with that method to have to make adjustments as you go along, but that’s ok with me. In this case, it turns out that positioning within the painting wasn’t the problem. The problem was that I hadn’t worked out exactly how I was going to illustrate the layers of rocks growing right behind the bushes and small trees. And to make matters worse, I decided to do the foreground first……not my usual style. I just loved those plants and couldn’t wait to start painting them. 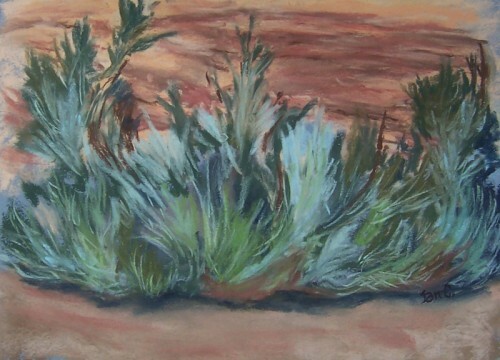 In truth, the rocks are very complicated and would have been difficult painting in soft pastel even without the bushes. I have to admit that I have never removed and repainted an area as many times as I did with this one. Finally, I surrendered and just put smeary lines the color of the rocks in the background and accepted that some people will think it’s a very BROWN stormy sky or an out-of-focus landscape of sand and rocks. So be it. I guess sometimes I learn more than others! Just a version of the road from Las Vegas to Los Angeles. 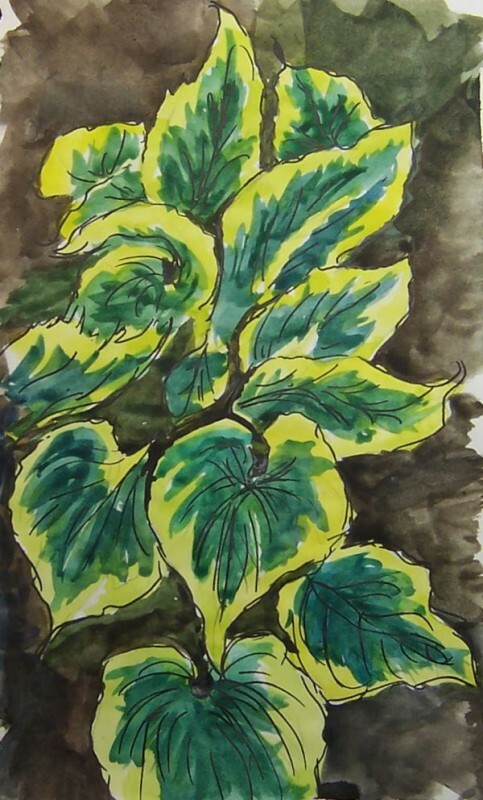 As you can see, I took a lot of artist’s license in both color and foliage………but that’s the fun of painting, isn’t it? This is an 8 X 11 done on Fabriano Paper and using a whole bunch of soft pastels. I didn’t really keep track, but I’m sure Ludwigs were predominant. I feel like I’m heading off to blue skies and new adventures with this one. Enjoy! Comments are always welcome. Well, this was a real learning process……don’t buy cheap paper, even for practice! I saw that the paper in the pad had texture on both sides, but I thought it looked different and might be fun to work with. (I tend to work on the smooth side of Mi-Tientes, etc.) Little did I know that the texture was like a million tiny knife slits which made it difficult to cover the color of the paper (weird grey/brown), but completely controlled how the pastel worked into it. Lots of rubbing and smudging went on. As soon as I find the pad on the shelf with my other pastel pads, it is going to join the various items collected in the land dump where it belongs. Sometimes, I just mess around and see what happens……………..rather weird, isn’t it? 100 Pastel Challenge – No. 75! This is number 75 of a challenge to complete 100 versions of the same painting, each within 30 minutes and my size is 5″ X 7″. If you would like to see the other 74, just keep scrolling down through the blog! (Or check the category list over on the right of the page). No. 30! Only 70 more to go! 100 Pastels – 2 More!